Carnivorous plants are plants that derive some or most of their nutrients (but not energy) from trapping and consuming animals or protozoans, typically insects and other arthropods. 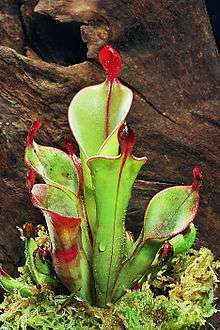 Carnivorous plants have adapted to grow in places with high light where the soil is thin or poor in nutrients, especially nitrogen, such as acidic bogs and rock outcroppings. Charles Darwin wrote Insectivorous Plants, the first well-known treatise on carnivorous plants, in 1875. True carnivory is thought to have evolved independently nine times in five different orders of flowering plants, and is represented by more than a dozen genera. This classification includes at least 583 species that attract, trap and kill prey, absorbing the resulting available nutrients. Additionally, over 300 protocarnivorous plant species in several genera show some but not all of these characteristics. Lobster-pots, also known as eel traps, force prey to move towards a digestive organ with inward-pointing hairs. In the genus Sarracenia, the problem of pitcher overflow is solved by an operculum, which is essentially a flared leaflet that covers the opening of the rolled-leaf tube and protects it from rain. Possibly because of this improved waterproofing, Sarracenia species secrete enzymes such as proteases and phosphatases into the digestive fluid at the bottom of the pitcher; Heliamphora relies on bacterial digestion alone. The enzymes digest the proteins and nucleic acids in the prey, releasing amino acids and phosphate ions, which the plant absorbs. The pitfall trap has evolved independently in at least two other groups. The Albany pitcher plant Cephalotus follicularis is a small pitcher plant from Western Australia, with moccasin-like pitchers. The rim of its pitcher's opening (the peristome) is particularly pronounced (both secrete nectar) and provides a thorny overhang to the opening, preventing trapped insects from climbing out. In at least one species, Sarracenia flava, the nectar bribe is laced with coniine, a toxic alkaloid also found in hemlock, which probably increases the efficiency of the traps by intoxicating prey. The flypaper trap utilizes sticky mucilage, or glue. The leaf of flypaper traps is studded with mucilage-secreting glands, which may be short (like those of the butterworts), or long and mobile (like those of many sundews). Flypapers have evolved independently at least five times. There is evidence that some clades of flypaper traps have evolved from morphologically more complex traps such as pitchers. The only two active snap traps—the Venus flytrap (Dionaea muscipula) and the waterwheel plant (Aldrovanda vesiculosa) - had a common ancestor with the snap trap adaptation, which had evolved from an ancestral lineage that utilized flypaper traps. Their trapping mechanism has also been described as a "mouse trap", "bear trap" or "man trap", based on their shape and rapid movement. However, the term snap trap is preferred as other designations are misleading, particularly with respect to the intended prey. 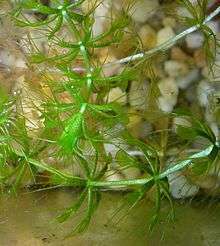 Aldrovanda is aquatic and specialised in catching small invertebrates; Dionaea is terrestrial and catches a variety of arthropods, including spiders. Bladder traps are exclusive to the genus Utricularia, or bladderworts. The bladders (vesicula) pump ions out of their interiors. Water follows by osmosis, generating a partial vacuum inside the bladder. The bladder has a small opening, sealed by a hinged door. In aquatic species, the door has a pair of long trigger hairs. Aquatic invertebrates such as Daphnia touch these hairs and deform the door by lever action, releasing the vacuum. The invertebrate is sucked into the bladder, where it is digested. Many species of Utricularia (such as U. sandersonii) are terrestrial, growing in waterlogged soil, and their trapping mechanism is triggered in a slightly different manner. 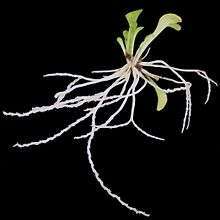 Bladderworts lack roots, but terrestrial species have anchoring stems that resemble roots. Temperate aquatic bladderworts generally die back to a resting turion during the winter months, and U. macrorhiza appears to regulate the number of bladders it bears in response to the prevailing nutrient content of its habitat. To be defined as carnivorous, a plant must first exhibit an adaptation of some trait specifically for the attraction, capture, or digestion of prey. 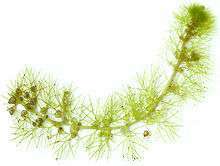 Only one trait needs to have evolved that fits this adaptive requirement, as many current carnivorous plant genera lack some of the above-mentioned attributes. The second requirement is the ability to absorb nutrients from dead prey and gain a fitness advantage from the integration of these derived nutrients (mostly amino acids and ammonium ions) either through increased growth or pollen and/or seed production. However, plants that may opportunistically utilize nutrients from dead animals without specifically seeking and capturing fauna are excluded from the carnivorous definition. The second requirement also differentiates carnivory from defensive plant characteristics that may kill or incapacitate insects without the advantage of nutrient absorption. Due to the observation that many currently classified carnivores lack digestive enzymes for breaking down nutrients and instead rely upon mutualistic and symbiotic relationships with bacteria, ants, or insect, this adaptation has been added to the carnivorous definition. 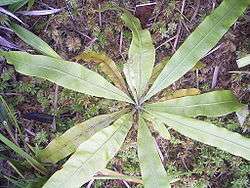 Despite this, are cases where plants appear carnivorous, in that they fulfill some of the above definition, but are not truly carnivorous. 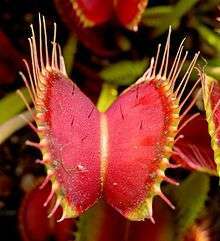 Some botanists argue that there is a spectrum of carnivory found in plants: from completely non-carnivorous plants like cabbages, to borderline carnivores, to unspecialised and simple traps, like Heliamphora, to extremely specialised and complex traps, like that of the Venus flytrap. The active glue traps use rapid plant movements to trap their prey. Rapid plant movement can result from actual growth, or from rapid changes in cell turgor, which allow cells to expand or contract by quickly altering their water content. Slow-moving flypapers like Pinguicula exploit growth, while the Venus flytrap uses such rapid turgor changes which make glue unnecessary. The stalked glands that once made glue became teeth and trigger hairs in Drosera —an example of natural selection hijacking preexisting structures for new functions. Recent taxonomic analysis of the relationships within the Caryophyllales indicate that the Droseraceae, Triphyophyllum, Nepenthaceae and Drosophyllum, while closely related, are embedded within a larger clade that includes non-carnivorous groups such as the tamarisks, Ancistrocladaceae, Polygonaceae and Plumbaginaceae. Interestingly, the tamarisks possess specialised salt-excreting glands on their leaves, as do several of the Plumbaginaceae (such as the sea lavender, Limonium), which may have been co-opted for the excretion of other chemicals, such as proteases and mucilage. Some of the Plumbaginaceae (e.g. Ceratostigma) also have stalked, vascularised glands that secrete mucilage on their calyces and aid in seed dispersal and possibly in protecting the flowers from crawling parasitic insects. The balsams (such as Impatiens), which are closely related to the Sarraceniaceae and Roridula, similarly possess stalked glands. Botanical carnivory has evolved in several independent families peppered throughout the angiosperm phylogeny, showing that carnivorous traits underwent convergent evolution multiple times to create similar morphologies across disparate families. 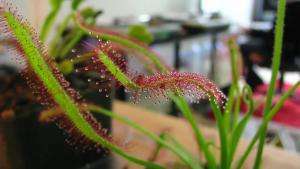 In horticulture, carnivorous plants are considered a curiosity or a rarity, but are becoming more common in cultivation with the advent of mass-production tissue-culture propagation techniques. Venus flytraps are still the most commonly grown, usually available at garden centers and hardware stores, sometimes offered alongside other easy to grow varieties. 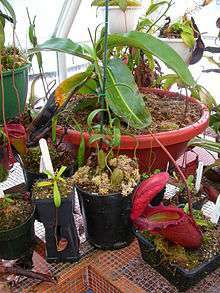 Nurseries that specialize in growing carnivorous plants exclusively also exist, more uncommon or demanding varieties of carnivorous plants can be obtained from specialist nurseries. 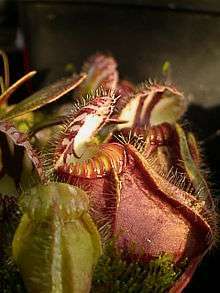 California Carnivores is a notable example of such a nursery that specializes in the cultivation of carnivorous plants. It is owned and operated by horticulturalist, Peter D'Amato. Ironically, carnivorous plants are themselves susceptible to infestation by parasites such as aphids or mealybugs. Although small infestations can be removed by hand, larger infestations necessitate use of an insecticide. ↑ Clarke C.M. ; Bauer U.; Lee C.C. ; Tuen A.A.; Rembold K.; Moran J.A. (2009). "Tree shrew lavatories: a novel nitrogen sequestration strategy in a tropical pitcher plant". Biology Letters. 5 (5): 632–635. doi:10.1098/rsbl.2009.0311. PMC 2781956 . PMID 19515656. ↑ Chin L.; Moran J.A. ; Clarke C. (2010). "Trap geometry in three giant montane pitcher plant species from Borneo is a function of tree shrew body size". New Phytologist. 186 (2): 461–470. doi:10.1111/j.1469-8137.2009.03166.x. PMID 20100203. ↑ Clarke C.; Moran J.A. ; Chin L. (2010). "Mutualism between tree shrews and pitcher plants: perspectives and avenues for future research". Plant Signaling & Behavior. 5 (10): 1187–1189. doi:10.4161/psb.5.10.12807. ↑ Darwin C (1875). Insectivorous plants. London: John Murray. ISBN 1-4102-0174-0. Archived from the original on 2006-10-23. 1 2 3 4 Givnish, T. J. (2015). 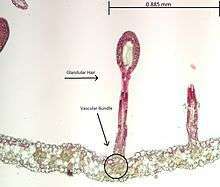 "New evidence on the origin of carnivorous plants". PNAS. 112: 10–11. Bibcode:2015PNAS..112...10G. doi:10.1073/pnas.1422278112. 1 2 3 4 5 Pavlovic, Andrej (2015). "A novel insight into the cost-benefit model for the evolution of botanical carnivory". Annals of Botany. 115 (7): 1075–1092. doi:10.1093/aob/mcv050. PMC 4648460 . PMID 25948113. 1 2 Albert, V.A. ; Williams, S.E. ; Chase, M.W. (1992). "Carnivorous plants: Phylogeny and structural evolution". Science. 257 (5076): 1491–1495. Bibcode:1992Sci...257.1491A. doi:10.1126/science.1523408. PMID 1523408. 1 2 Ellison, A.M.; Gotelli, N.J. (2009). "Energetics and the evolution of carnivorous plants—Darwin's 'most wonderful plants in the world'.". Journal of Experimental Botany. 60 (1): 19–42. doi:10.1093/jxb/ern179. PMID 19213724. ↑ Poppinga S.; Hartmeyer S.R.H. ; Seidel R.; Masselter T.; Hartmeyer I.; Speck T. (2012). 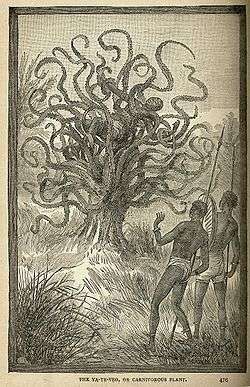 "Catapulting tentacles in a sticky carnivorous plant". PLoS ONE. 7 (9): e45735. Bibcode:2012PLoSO...745735P. doi:10.1371/journal.pone.0045735. PMC 3458893 . PMID 23049849. ↑ Mithofer, A (2011). "Carnivorous pitcher plants: Insights in an old topic". Phytochemistry. 72 (13): 1678–1682. doi:10.1016/j.phytochem.2010.11.024. PMID 21185041. ↑ Clarke (1993). 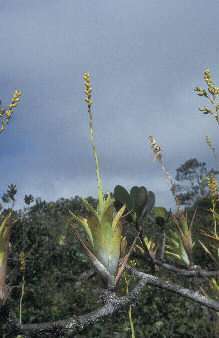 "The possible functions of the thorns of Nepenthes bicalcarata (Hook.f.) pitchers" (PDF). Carnivorous Plant Newsletter. 22 (1–2): 27–28. ↑ Mody N. V.; Henson R.; Hedin P. A.; Kokpol U.; Miles D. H. (1976). "Isolation of the insect paralyzing agent coniine from Sarracenia flava". Cellular and Molecular Life Sciences. 32 (7): 829–830. doi:10.1007/BF02003710. 1 2 3 Gibson, T.C. ; Waller, D.M. (2009). "Evolving Darwin's 'most wonderful' plant: ecological steps to a snap-trap". New Phytologist. 183 (3): 575–587. doi:10.1111/j.1469-8137.2009.02935.x. PMID 19573135. 1 2 Hodick D, Sievers A (1989). "The action potential of Dionaea muscipula Ellis" (PDF). Planta. 174 (1): 8–18. doi:10.1007/BF00394867. ↑ Hodick D, Sievers A (1988). "On the mechanism of closure of Venus flytrap (Dionaea muscipula Ellis)" (PDF). Planta. 179 (1): 32–42. doi:10.1007/BF00395768. PMID 24201419. ↑ Forterre Y, Skotheim JM, Dumais J, Mahadevan L (2005). "How the Venus flytrap snaps". Nature. 433 (7024): 421–5. Bibcode:2005Natur.433..421F. doi:10.1038/nature03185. PMID 15674293. 1 2 Schnell, Donald E. (2002). Carnivorous plants of the United States and Canada. Timber Press. ISBN 0-88192-540-3. ↑ Radhamani, T.R. ; Sudarshana, L.; Krishnan, R. (1995). "Defence and carnivory: Dual role of bracts in Passiflora foetida". Journal of Biosciences. 20 (5): 657–664. doi:10.1007/BF02703305. ↑ Darnowski, D.W.; Carroll, D.M. ; Płachno, B.; Kabanoff, E.; Cinnamon, E. (2006). 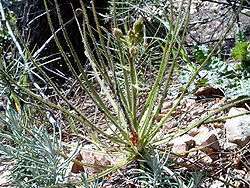 "Evidence of protocarnivory in triggerplants (Stylidium spp. ; Stylidiaceae)". Plant Biology. 8 (6): 805–812. doi:10.1055/s-2006-924472. PMID 17058181. ↑ Ellison, A. M.; Farnsworth, E.J. (2005). "The cost of carnivory for Darlingtonia californica (Sarraceliaceae): Evidence from relationships among leaf traits". Journal of Botany. 92: 1085–1093. doi:10.3732/ajb.92.7.1085. PMID 21646130. ↑ Cameron K, Wurdack KJ, Jobson RW (2002). "Molecular evidence for the common origin of snap-traps among carnivorous plants". American Journal of Botany. 89 (9): 1503–1509. doi:10.3732/ajb.89.9.1503. PMID 21665752. ↑ Slack A (1988). Carnivorous plants. London: Alphabooks. pp. 18–19. ISBN 0-7136-3079-5. ↑ Cameron KM, Chase MW, Swensen SM (1995). "Molecular evidence for the relationships of Triphyophyllum and Ancistrocladus". American Journal of Botany. 83 (6): 117–118. doi:10.2307/2445804. JSTOR 2445804. Discussion of this paper at the International carnivorous plant society website (original paper requires JSTOR subscription). ↑ Zamora R, Gomez JM, Hodar JA (1997). "Responses of a carnivorous plant to prey and inorganic nutrients in a Mediterranean environment". Oecologia. 111 (4): 443–451. doi:10.1007/s004420050257. 1 2 Thoren LM, Karlsson PS (1998). "Effects of supplementary feeding on growth and reproduction of three carnivorous plant species in a subarctic environment". Journal of Ecology. 86 (3): 501–510. doi:10.1046/j.1365-2745.1998.00276.x. ↑ Hanslin HM, Karlsson PS (1996). "Nitrogen uptake from prey and substrate as affected by prey capture level and plant reproductive status in four carnivorous plant species". Oecologia. 106 (3): 370–375. doi:10.1007/BF00334564. ↑ Karlsson PS, Pate JS (1992). "Contrasting effects of supplementary feeding of insects or mineral nutrients on the growth and nitrogen and phosphorus economy of pygmy species of Drosera". Oecologia. 92 (1): 8–13. doi:10.1007/BF00317256. ↑ Gallie, D. R.; Chang, S. C. (1997). "Signal transduction in the carnivorous plant Sarracenia purpurea - regulation of secretory hydrolase expression during development and in response to resources". Plant Physiology. 115 (4): 1461–1471. doi:10.1104/pp.115.4.1461. PMC 158611 . PMID 9414556. ↑ Zamora R, Gomez JM, Hodar JA (1988). "Fitness responses of a carnivorous plant in contrasting ecological scenarios". Ecology. 79 (5): 1630–1644. doi:10.1890/0012-9658(1998)079[1630:FROACP]2.0.CO;2. ISSN 0012-9658. ↑ Brewer JS (2002). "Why don't carnivorous pitcher plants compete with non-carnivorous plants for nutrients?". Ecology. 84 (2): 451–462. doi:10.1890/0012-9658(2003)084[0451:WDTCPP]2.0.CO;2. ISSN 0012-9658. ↑ Knight SE, Frost TM (1991). "Bladder control in Utricularia macrorhiza - lake-specific variation in plant investment in carnivory". Ecology. Ecological Society of America. 72 (2): 728–734. doi:10.2307/2937212. JSTOR 2937212. ↑ Greenwood M.; Clarke C.; Lee C.C. ; Gunsalam A.; Clarke R.H. (2011). 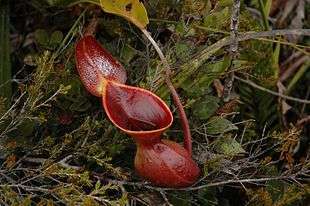 "A unique resource mutualism between the giant Bornean pitcher plant, Nepenthes rajah, and members of a small mammal community". PLoS ONE. 6 (6): e21114. Bibcode:2011PLoSO...621114G. doi:10.1371/journal.pone.0021114. ↑ Scharmann M.; Grafe T.U. (2013). "Reinstatement of Nepenthes hemsleyana (Nepenthaceae), an endemic pitcher plant from Borneo, with a discussion of associated Nepenthes taxa". Blumea. 58: 8–12. doi:10.3767/000651913X668465. 1 2 3 4 Jürgens, Andreas; Sciligo, Amber; Witt, Taina; El-Sayed, Ashraf M.; Suckling, D. Max (2012). "Pollinator-prey conflict in carnivorous plants". Biological Reviews. 87: 602–615. ↑ Muller K, Borsch T, Legendre L, Porembski S, Theisen I, Barthlott W (2004). "Evolution of carnivory in Lentibulariaceae and the Lamiales". Plant Biology (Stuttgart). 6 (4): 477–490. doi:10.1055/s-2004-817909. PMID 15248131. ↑ Eilenberg, Haviva; Pnini-Cohen, Smadar; Rahamim, Yocheved; Sionov, Edward; Segal, Esther; Carmeli, Shmuel; Zilberstein, Aviah (December 2009). 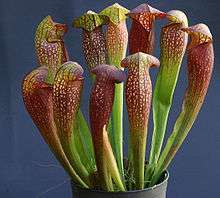 "Induced production of antifungal naphthoquinones in the pitchers of the carnivorous plant Nepenthes khasiana". Journal of Experimental Botany. Oxford University Press. 61 (3): 911–922. doi:10.1093/jxb/erp359. PMC 2814117 . PMID 20018905. Retrieved 2010-04-22. ↑ Ron Sullivan; Joe Eaton (2007-10-27). "The Dirt: Myths about man-eating plants - something to chew on". San Francisco Chronicle. Retrieved 2007-10-26. Ellison, A.M. 2006. "Nutrient Limitation and Stoichiometry of Carnivorous Plants." (PDF). 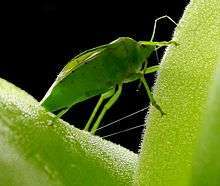 (334 KB) Plant Biol. 8: 740–747.